An attendant feeds “Cloaca” (by the “artist” Wim Delvoye) a meal that seemed to be a sausage frittata. 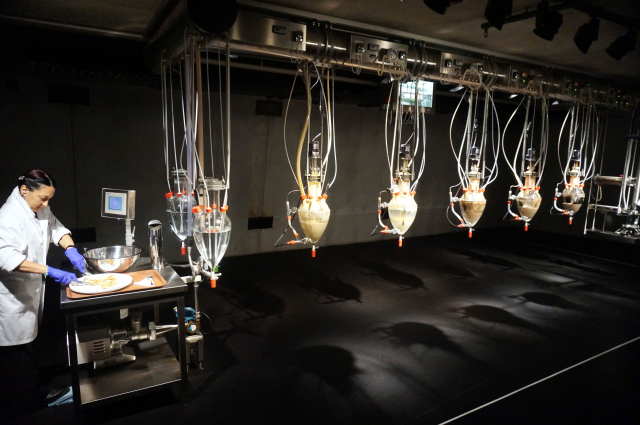 This machine mechanically and chemically replicates the digestive system of a mammal. It is fed twice a day and defecates daily at 2pm. It is hard to ignore a private gallery that houses a $100 million collection featuring everything from a suicide bomber's remains sculpted in dark chocolate to 150 porcelain sculptures of anatomically correct representations of women's pudenda.